Next on the Thanksgiving special hit parade is “Garfield’s Thanksgiving.” First airing on CBS in 1989, this special is enjoyable, though weaker than the Halloween and Christmas “Garfield” specials. I wrote about this one in my post about the “Garfield: Holiday Celebrations” DVD, but here I’ll elaborate. 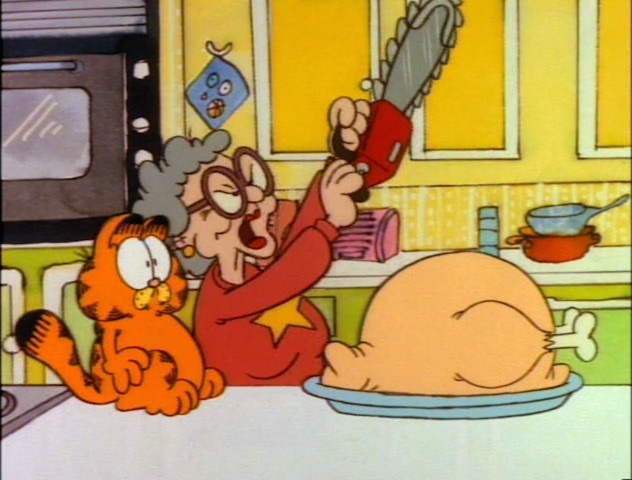 The plot: Garfield’s all geared up for Thanksgiving. That is, until he’s put on a diet by Liz the vet, who Jon invites over for Thanksgiving dinner. Making things worse is Jon’s inept meal preparation, which lead to the Arbuckle household requiring help to finish the meal on time. Grandma Arbuckle’s appearance is fun, as is Jon explaining to (and boring) Liz about the origins and traditions of Thanksgiving. Interesting contrast to the current comic strips (and “The Garfield Show” TV series) where Jon and Liz are now a couple. The design of Jon’s house, along with some of the incidental music, is the same as that from “Garfield and Friends,” which was on Saturday mornings at this time. One oddity is that Jon’s incapable of preparing a Thanksgiving meal. He seems to have no problem cooking similar foods (including chicken, etc.) for Garfield’s voracious meals. Usually Jon’s cooking skills only become disastrous when he’s trying a new or unconventional dish. Maybe they just always went to Jon’s parents’ farm for Thanksgiving each year until now? This special aired for a time on CBS, but hasn’t been seen on TV in years.